We have many, many incredible volunteers working on this campaign. They're without a doubt one of the most important parts of this whole effort. Today we thought we'd take the time to honor one of them. Meet Arnie Lazarus! Arnie is a native New Yorker, but has called San Francisco home since the 1960's. He lives in the Lower Haight and is a neighborhood fixture — if you've ever been in that neighborhood, you've probably seen him making the trek from Café du Soleil on Fillmore and Waller to Café International on Fillmore and Haight. Arnie's been an incredible help as a photographer. He goes with Thea from event to event, doing the invaluable work of documenting our campaign. Here are two things you should know about Arnie. Firstly, he began weightlifting competitively — in his sixties. Don't believe us? Check out the video below. Age 67, deadlifting nearly 400 pounds. 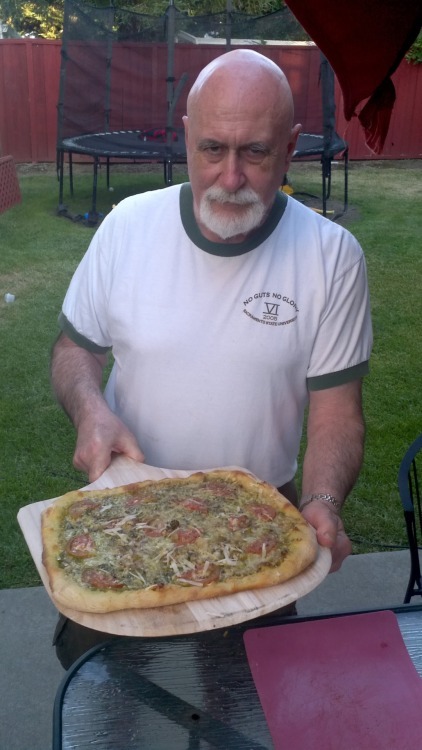 Secondly, he makes incredible pizza. That's pesto, blue cheese, and heirloom tomatoes — in case you're wondering. If you really want a good dough, Arnie recommends Caputo flour, double-zero, and available at Rainbow Grocery in the red bag. He also recommends a thorough reading of Peter Reinhart's book American Pie as a primer on all things pizza. If you think you want to take on Arnie's pizza skills, mark your calendars for our August 4th Volunteer Pizza Bake-Off! Good times, good food, and a chance to meet other folks volunteering for Thea as she does the good work of getting to know this district. Haven't volunteered before? Is the incentive of getting to try Arnie's pizza drawing you in? We've got you covered. We're down to our last two weekends of signature gathering and need your help. Get in touch with us today.